This page contains the dome-style AHD cameras (HD over coax) that CCTV Camera Pros supplies. These security cameras support 1080p / 2 megapixel resolution. Some dome housings are outdoor / weatherproof rated and others must only be used indoors. Not familiar with AHD technology? Learn more by this article: What is AHD? For recording, AHD security cameras must be used with a compatible AHD DVR. We high recommend iDVR-PRO surveillance DVRs for use with these cameras. One of the advantages of AHD cameras is that they can use the same RG59 coax cable as traditional analog CCTV cameras and the cable runs can be just as long (max distance about 800 feet). Our RG59 Siamese cable options have been tested with AHD cameras and are guaranteed by CCTV Camera Pros to work with the AHD cameras that we supply. In addition to RG59 coax cable, dome AHD cameras can also be wired using CAT-5 / CAT-5e cable by using video baluns. 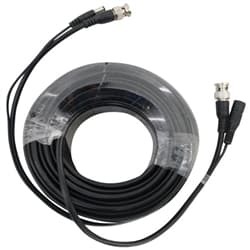 Video baluns convert the UTP cable in CAT5 to BNC connections on the camera and DVR end of the cable run. You can learn more about video baluns for AHD cameras here. AHD cameras do require a compatible HD DVR in order to capture high definition video. CCTV Camera Pros offers hybrid DVRs that work with both HD-TVI, AHD and standard definition CCTV cameras. We highly recommend our iDVR-PRO hybrid DVRs. You can learn more about these DVRs here. Are you looking for a test monitor to use when installing your AHD cameras? Click here to learn about the MON-4HD AHD test monitor that we supply. This monitor allows you to connect the BNC video output of an AHD camera to a BNC input on the monitor to display the native video.